We have already covered an article on Ringtone website Tonzr. It has got a huge collection of Ringtones from Trance to Hip-Hop. But, some songs that are quite recent or unique may not be available at Tonzr. One fine day, even I was in search of a ringtone from the latest movie, but was unable to find it. Best part was I had that entire song saved in my desktop. So, what’s next? I could have tried any free software to edit and cut the mp3 file. But, I will have to download the software and install it in my computer, just to create one ringtone. Instead of this, I tried online mp3 editing website known as Mp3cut.net. Mp3cut.net is a free online web tool that allows you to edit mp3 files. You don’t need to install anything on your Computer. Just upload mp3 file from your computer. 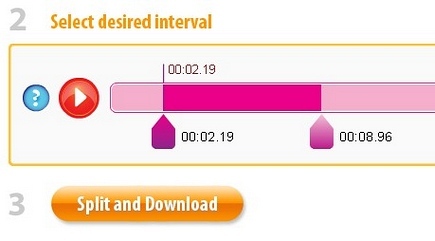 Select the interval, the Slider at the right side will set the starting point and the left slider will set the ending point. Click on “Split and Download” button. Within few seconds mp3 file which you have cut will be ready for download.